Sydney, one of the largest and most stunning cities in Australia, is a popular destination at any time of the year. With an exciting atmosphere, Sydney is also home to an interesting mixture of both historic and modern buildings, many of which date back to the late 18th century. Sydney's combination of stunning weather, world-class tourist attractions and superb Sydney beaches attracts people from all over the world, throughout the year. There are a good selection of tourism and tourist information offices and outlets throughout Sydney and these provide detailed Sydney tourist information, such as brochures, maps of Sydney, attractions information, opening hours, theatre information, directions and general Sydney tourism and tourist information. When travelling in Sydney, as in any large city, is it advisable to always maintain an awareness of your surroundings and not look like a tourist when visiting Sydney. 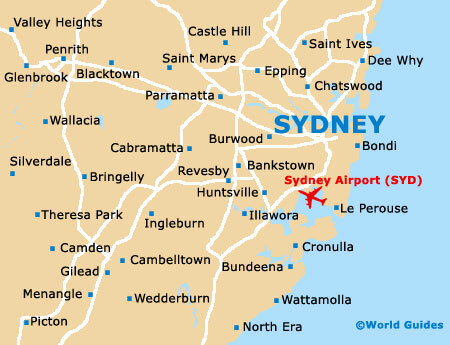 Although Sydney's crime levels are fairly low, try to blend in, look like you know where you are going and always be careful with hand baggage, handbags, purses and money. The incredibly diverse city of Sydney is home to many different cultures and religious beliefs and most religions have a presence in the Sydney area. Many Australians are at least nominally Christian in their belief, although this majority is getting smaller. Most Protestant churches in Sydney have merged to form the Uniting Church, although the Anglican Church of Australia remains a separate entity. Catholic churches in Sydney are particularly popular, due to a large population with an Irish or Mediterranean background. There are a number of other religious minorities in the Sydney area, such as Buddhists, Jews and Muslims. Most pharmacies in Sydney city centre open from 08:00 until 20:00 or later and major pharmaceutical chains in Sydney include Soul Pattinson and Amcal, who can fill and dispense prescriptions and medicines. English is the most commonly spoken language in Sydney and Australia, although many other nationalities and ethnic cultures are well represented in Sydney. Although Australian accents in Sydney can be strong, they are not difficult to understand. All visitors to Sydney and Australia as a whole need a visa and application forms are available from either Australian diplomatic missions overseas or travel agents, where you can either apply in person or by mail. Many travel agents and airlines now also grant on-the-spot Australian visas for up to three months, using the Electronic Travel Authority system (ETA). New Zealand nationals are the only country not requiring these travel visas, although they do receive a 'special category' visa when arriving at Sydney. There are extremely strict regulations allowing overseas visitors to work in Sydney and these are issued by the Department of Immigration and Multicultural Affairs (DIMA). Many visitors aged between 18 to 30 from the United Kingdom, the Republic of Ireland, Canada, South Korea, Germany, the Netherlands, Japan and Malta may be eligible for a Working Holiday Visa, lasting up to 12 months. Most services in Sydney don't expect to be tipped, although porters, waiters and taxi drivers are generally tipped small amounts. Most restaurants in Sydney usually expect a tip of around 10%, to the nearest Australian dollar, in recognition of prompt, courteous service and good food. Generally, no other public service workers in the city of Sydney expect to be tipped. Sydney has a 10% goods and services tax (GST) that is applied to most items purchased in the city, although fresh food produce can be exempt. If you purchase goods in Sydney that have a total value of more than AUD 300 from a single supplier, you can claim a full refund of the tax within 28 days. Cheque refunds are available at Sydney Airport at designated booths. Smoking in Sydney is not allowed in public buildings, restaurants, outdoor areas and sporting arenas and on public transport in Sydney. When is Sydney, it is advisable not to smoke in enclosed spaces in Sydney unless others around you are also smoking. Much business is done over the dinner table in Sydney and business lunches are often held at restaurants throughout Sydney. This is a popular way to conduct business in Sydney and most restaurants should be booked in advance. Sydney has an enormous selection of public houses, in and around central Sydney. With a good selection of lively pubs and wine bars in Sydney city centre, many with spectacular views of the city and harbour, most of the pubs and wine bars in Sydney are friendly places to relax.